Second-screen advertising synching is expected to take off in 2015, according to the first of Millward Brown’s predictions for 2015. The research firm’s annual Digital and media Predictions report predicted the advertising industry will ramp up efforts to reinforce TV advertising through reminders and complementary messaging across digital devices as a way of continuing consumer engagement. This is achieved through second-screen advertising synching, which relies on listening technology to identify when an ad has run on TV. It then immediately delivers relevant messages through digital channels. Millward Brown said the technology is now available through a number of vendors including Civolution, Infectious Media, Mediasynched and WyWy. “Second-screen synching isn’t just about media efficiency and hitting consumers with multiple messages, it’s also a new storytelling opportunity that allows brands to add extra value for people who just watched their TV spot,” said global brand director for digital, Duncan Southgate. In Millward Brown’s 2014 Global AdReaction study, the research firm found 35 per cent of all screen time for consumers now involves simultaneously using a digital device while watching TV. 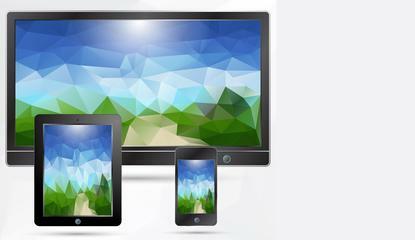 It also found consumers are more likely to use their digital screen for activity unrelated to TV. Only 11 per cent of multi-screen users proactively use a digital device to follow up on a TV ad at present, making technologies like second-screen a great opportunity for marketers to foster better cross-screen connections, Millward Brown said. A survey undertaken by WyWy and TNS Infratest in October last year on the impact of synched ads also cited a 38 per cent uplift in a consumer’s positive brand attitude KPI as a result of using second-screen synched advertising, as well as an 18 per cent rise in word of mouth KPIs. That report was based on women aged 25 to 55 who regularly watch TV and own a second-screen device. As an example of second-screen storytelling in action, the company said a marketer could follow up an automotive ad on TV in seconds with an offer to arrange a test drive, or continue a storyline from the advertisement with a call to action to mobile and tablet device users. It pointed out car manufacturer, Hyundai, is using this technology today. Second-screen synching could also be used to hijack a competitor’s ads by running targeted digital communication countering any messages delivered on TV, Millward Brown said. “With media channels evolving at breakneck speed, marketers are well served by exploring new innovations – like second-screen synching – and the unknown,” Southgate said.